I recently got the opportunity to try out a super cool kit from Lifestyle Crafts called the L Letterpress. Letter pressing is the act of inking and debossing paper at the same time, it gives a wonderful clean crisp image and is usually only done with large expensive letterpress machines. 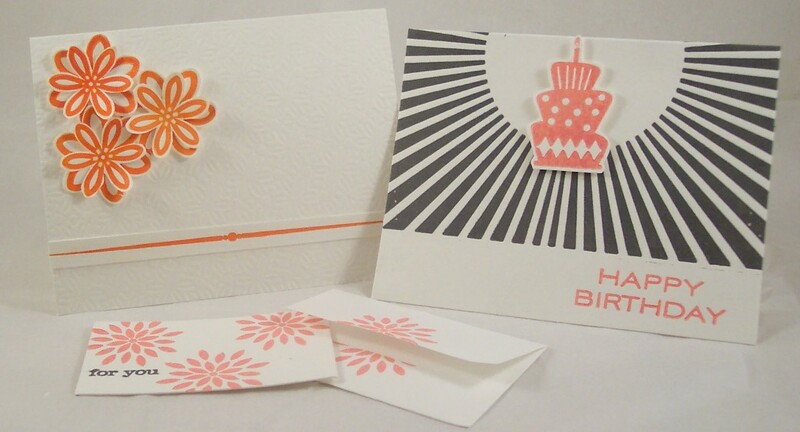 But Lifestyle Crafts has come out with an easy and affordable way to do Letterpress at home. Click here to visit the Lifestyle Crafts website for additional product info, ideas and technique videos. you can buy additional supplies like printing plates, lots of great colors of ink, papers, cards, envelopes and more. I found the L Letterpress tool really easy to use. You start by adding adhesive to your printing plate and adhering it on one side of the platform, laying your paper on the other side of the platform, using the grid lines to make sure everything lines up the way you want it. You can also the foam placement guides to make sure the paper doesn’t move or for easy alignment when printing multiples. A tip: I personally found laying my plate face down on my paper with adhesive side up and them folding over the platform to pick it up helped me be sure it was exactly where I wanted it. You then add a small amount of ink to the ink base and using the brayer roll out a thin layer of ink, getting a nice even coverage on the brayer. Getting the right amount of ink is probably the most important step in getting good results and takes a little practice, not enough ink gives poor coverage and too much gets a blurry image. Roll the ink evenly over the template. Close the platform, roll the platform through to Epic machine and open the platform and that’s it, you’ve got an letterpress image, it’s that’s simple! Here’s some helpful tips I found while playing. -If you decide to get a Letterpress kit be sure to get the wipes, you’ll thank me 🙂 This ink is like nothing I’ve ever used before and you need the specially formulated wipes to clean up. And clean templates really well between inkings so you don’t get a color transfer. -The ink stays wet for awhile, be patient before touching it. -The foam paper guides are meant to lay beside your paper not on top, it can tear your paper if not, so be careful. -Print all one color first, changing ink colors is a little time consuming. -Be careful not to get ink on the edges of your templates and clean any excess ink of the base before pressing. -For deeper impressions add extra paper under the base, it really makes a difference. I’m sure alot of people are thinking this looks cool but wondering if they can use other supplies they might already have around so I tried a few things myself. First was using regular cardstock instead of the special letterpress paper, it did work but it was a much fainter impression but sometimes you might want a more subtle look. The letterpress paper really gives you that nice deep impression, takes the ink well and also does not show the impression on the backside. I also tried some stamping inks both dye based and pigment and found even using a brayer I always got alot of ink around the edges of my plates which transferred to the paper, I also didn’t get as nice of a clean crisp image. I’ll stick with the letterpress ink. If you already have a crank style die cutting machine you might be able to get the L Letterpress starter kit only, I tried it in a Cuttlebug and got the exact same results as in the Epic machine. Over all I found this machine to be really fun with a lot of different possibilities. In addition to the traditional Letterpress look, you can emboss only without ink, you can make pattern papers for backgrounds, layering, punching etc. You can cut out or color in images like you would with stamps, you can mix the ink for custom colors, you can even have custom plates made for yourself. How great for wedding and shower invites, business cards, the possibilities are endless. On the orange flower card I cut and layered images for dimension and embossed the background with out ink, the pink and gray cake card has a cut out image and the small note cards have matching envelopes, these small cards would be perfect for place cards, thank you notes, business cards, etc. 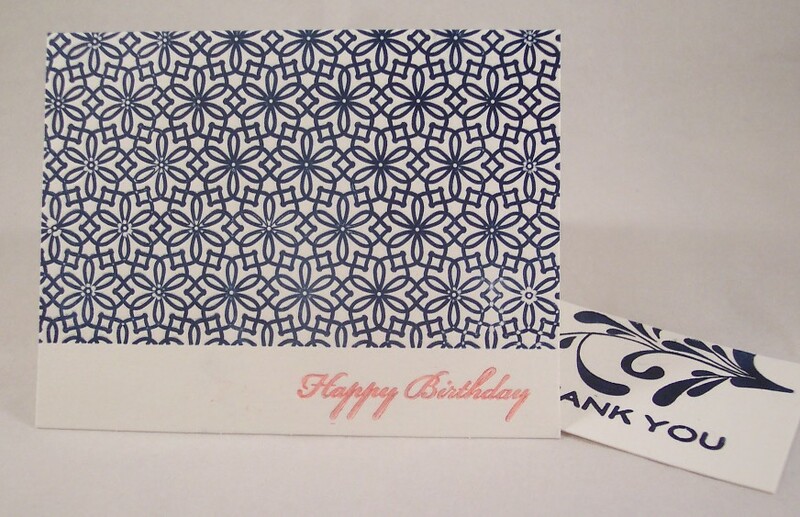 I love the simplicity of the all over navy floral background on the other birthday card, very classy! And here’s the best part, check back with me on Monday next week for a *very* exciting L Letterpress giveaway from Lifestyle Crafts!! You won’t want to miss it! And don’t forget to visit their website for more info and as a special bonus here’s a promo code: BLOGGOSSIP for Lifestylecrafts.com good for 25% off until the end of the month! Thanks for the comprehensive review and you’ve answered a couple of questions I’ve had which were whether you could use other papers and/or use the starter kit w/another crank die cutting machine ( I have a Cuttlebug too) . I look at this every time I’m in my fav paper store but always miss when they’re demo-ing it. Will definitely be back for that exciting announcement! Thank you so much for such great feedback on the Letterpress. Awesome to know it works well with the Cuttlebug too! oooh, can’t wait for Monday! Thanks for putting this info out there for people who are too afraid to try things out for themselves! I got one of these super fun starter kits for Christmas and it took me a while to figure out a couple of things I really need to share. 1. I didn’t get the wipes as my parents got this for me, but I just used clorox wipes and they work perfectly. 2. I looked all over for paper to use and I went to 5 different paper stores before Michaels and I figured out there that 140lb watercolor paper works great!!! You can cut it to whatever size you want. I just had to share that with someone because it really saved me a ton!! !